‘We are entrepreneurial, creative-spirited makers of places who bring new ideas and set new standards for urban living’... so trumpets Knight Dragon on its website. But when you see the scale and scope of its 130,000 sq m Greenwich Peninsula project, it’s not just talking the talk. This is the biggest single regeneration project that London has ever seen. The statistics tell their own immodest story. The plan is for £8.4bn to be invested in this fresh new London district of 150 acres over the next 20 years. Along with two schools planned for 2,000 pupils and 4,000 affordable homes, £500m will be spent across the seven new districts for an expected population of 35,000 straddling 1.6 miles of the River Thames and incorporating seven distinct neighbourhoods. Coming together now is the Design District that will attract start-ups and entrepreneurs in the areas of design, art, technology, food craft. It will be a place of flexible spaces. 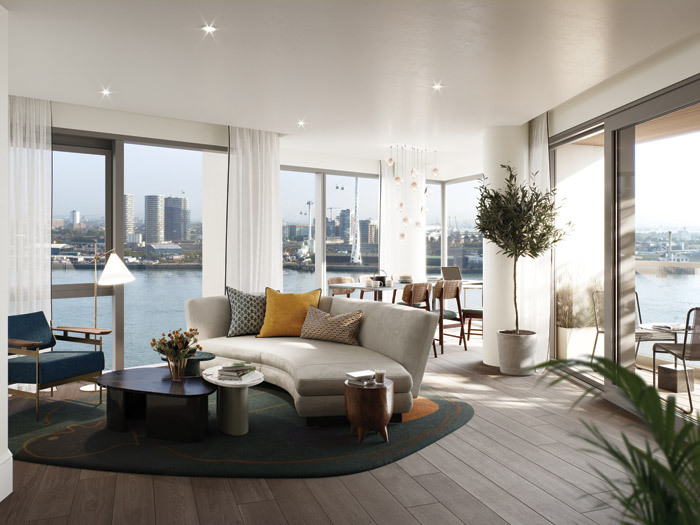 Lower Riverside will feature courtyard gardens, the Peninsula’s ‘village hall’. It’s where you’ll find the jetty and the aperture. This will be the ‘village hall’– a mixed-use community hub where Parkside meets Lower Riverside. It will include a retail unit, cafe, gym, prayer space, estate management office, and flexible spaces on the ground floor for community use. Commissioned by the main contractor Kier Construction to make and install the building’s facade, contracting team GLASSOLUTIONS had to meet tight guidelines on aesthetics and energy efficiency. Then there’s the Brickfields Film District where a film studio will be built. The existing presence on the peninsula of Ravensbourne College beside the O2 arena can’t be coincidence. It specialises in digital media and design and has specific courses in film and TV broadcasting, architecture and environmental design. This neighbourhood will fill with production houses, music studios and film stages. The area already has its own magazine, The Peninsulist, which helps to further foster the growing sense of community and has a big emphasis on community, arts, design and creativity. Due to be completed during 2018 is the first stage of the Peninsula’s P5K, a weaving, partly elevated walkway and running track. Knight Dragon has commissioned landscape firm Gross Max and architecture practice Diller, Scofidio + Renfo to oversee its first phase. The practice was responsible for New York’s High Line, a 1.45 mile elevated linear walkway and green space that is proving so popular. In Greenwich five connected ‘islands’, each hosting an elevated garden, will be supported by painted steel sculptural columns and will be connected by a floating walkway with minimalist glass balustrades. The route of Phase 1 will run from Peninsula Square, then go east to the Thames riverfront. 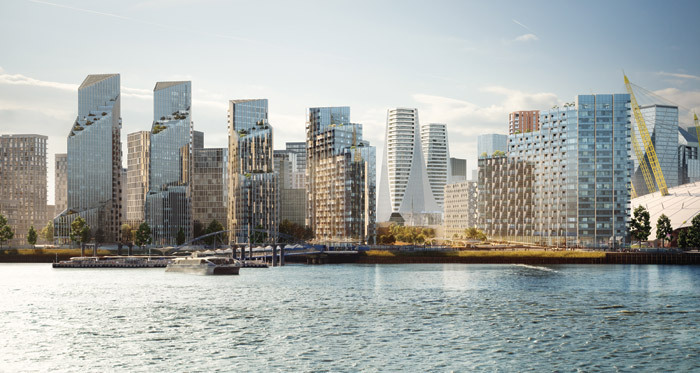 Peninsula Plaza will form a new multilayer park between the first two of five Upper Riverside buildings linking North Greenwich Pier to the O2 arena. P5K is elevated for a 190m stretch where it creates a pedestrian route at upper level and is then segregated from running and cycling tracks at ground level. When the whole route is completed by 2020, it will wrap around much of the Thames Path. Matthew Dearlove, head of design at Knight Dragon, talks of the area’s vast, 15-20- year timescale development and of its public realm strategy. Centre stage to so much development now, it recognises the many benefits of the ‘in-between places’ where folk can relax, meet, rejuvenate and enjoy life. Green space is central to this and there are plans to increase the peninsula’s existing park, to expand the children’s playgrounds, to increase access to the water and to introduce slow-speed streets. The emphasis will be on ‘streets rather than roads’ according to Dearlove, with the aim of producing a genuinely pedestrian-friendly place to live. This will be most obvious in the Parkside District that is destined to be family-friendly and will house the school and children’s play areas. Upper Riverside District will be the peninsula’s exclusive neighbourhood where American architects and urban planning giant SOM will work its magic. One of the ‘wow-factor’ developments will be in the Peninsula Central neighbourhood. Peninsula Place is a first UK project for Spanish architect Santiago Calatrava, a 130,000 sq m landmark for London that promises to transform the peninsula. 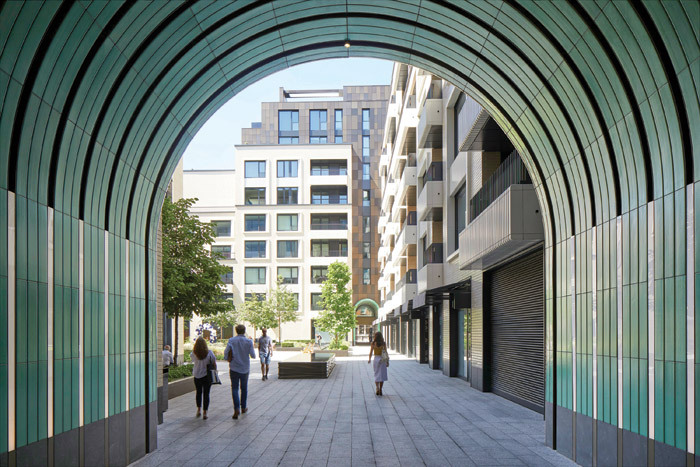 For locals, it means 800 new homes within three linked towers and green stepped terraces, while visitors will emerge from the Tube into a winter garden and find an urban forest , a galleria and pavement cafes and shops. And above them only glass, only sky. The urban forest will sit beneath a glass cupola that will let in natural light and unfold to let in the air and the weather when required. The galleria will lead to a white cantilevered footbridge that will link to the new public park beside the Thames in the Meridian Quays District, a waterside zone that will feature boutiques and bars, cafes and the ever-popular riverside living. Here there are also plans for a giant sundial to sit on the Zero Degrees Longitude Meridian Line that since 1851 has been one defining feature of Greenwich’s maritime heritage. 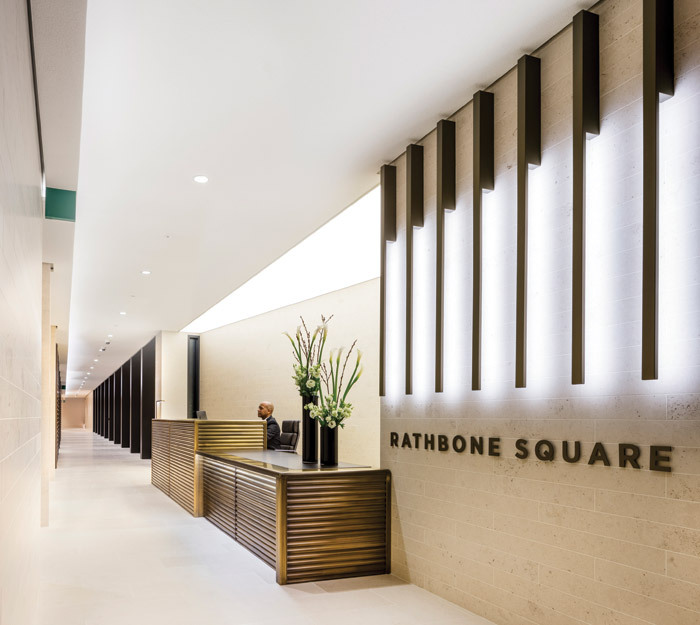 As one of the greenest cities of its size in the world, it’s fitting that London’s Rathbone Square development in Fitzrovia’s W1 postcode should offer a prominent arc-shaped grassy knoll. 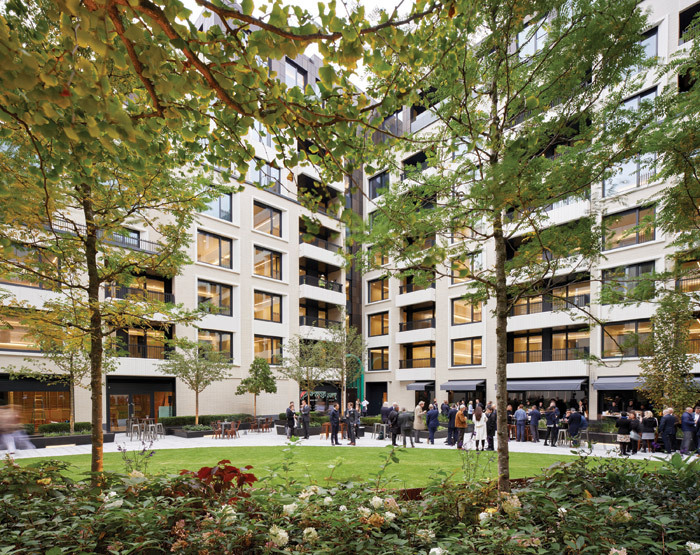 A collaboration between architecture practice Make and landscape architects at Gustafson, Porter + Bowman, this serendipitous 2.3 acre oasis between Rathbone Place and Newman Street is a pleasing relief just north of the noise and CO2 emissions of Oxford Street. With its water fountain recently completed, it now awaits a few more tenants to fill up the rest of its 2,500 sq m of retail space that lines the bottom of a mixed-use apartment and business block. The retail outlets also now bring life and commerce to what was previously ‘dead frontage’ on both Rathbone Place and Newman Street. Once the site of a giant Post Office sorting office and car park, the aim here on Great Portland Estate land was to combine a public, community plaza with what after 10pm becomes a private, gated residents’ space for those living in the 140 upmarket and 20 affordable-living apartments in Rathbone Square. Daytime sees a free flow of those traversing from the forthcoming Elizabeth Line at Tottenham Court Road Crossrail station 17m away or office workers using the grass for a lunch-time break. And there are those who are here through chance; the tourists, the shoppers, the curious. You can enter just up from Joe The Juice on Rathbone Place or from Newman Street beside a doll’s house-sized doughnuts and coffee shop. Both entrances trumpet their presence with bronze gates (designed by artist Robert Orchardson) and the striking jade green glazed ceramic passageways with their nod to nearby 18th-century Newman Passage, a satisfying, ‘hidden’ route from Soho to Fitzrovia. A third entrance also sports the bronze gates but is ‘open’, so no tunnel but that bit closer to the Tottenham Court Road Crossrail station at the end of the street. This is a ‘higher traffic route’ entrance that affords a layered vista of the square; first the trees, now the grass,then the buildings. And as you weave your way through, there is the large platinum and bronze urn for use as a public drinking fountain, designed by Alison Wilding. And the presence of two large black granite water tables within the square tell you that this is not just a cut-through but a garden that invites a change of pace. Water rills trickle and tinkle their courses along the edge of the square like discreet Madeira lavadas. In a prestigious vote of confidence last Christmas in this new location, Facebook opened a new London office on Rathbone Square’s south side. It houses the tech giant’s biggest engineering hub outside the USA, employs 800 and spans 22,500 sq m of prime real estate. Its interior was designed by Canadian-born American architect Frank Gehry. The building offers seven stories and its ground-level skylight strip allows a nosey glimpse down into the company’s basement social area. Graham Longman at Make Architects managed the building project that sees Facebook on the south side with a mixed L-shaped residential and office development to the north including 160 apartments, as of the summer all sold but one. The retail outlets are being snapped up too and alongside the doughnuts and juice you can also get a hair cut from a specialist barber’s. The space intended for a cafe remains vacant. The apartment block offers a small internal private garden, a wine storage and tasting room, a private cinema and a gym and swimming pool in the basement. Up top, an eco-friendly brown roof has been planted with wild flowers and grasses which will require minimum maintenance while acting as a habitat for birdlife and insects. It also houses photovoltaic panels which will power the lights in the building’s corridors and public spaces. Just 46 miles north of London is Bedford, home to 80 000, a county town and named after the Saxon chief Beda and a ford crossing the River Great Ouse. These days, Bedford sports a clutch of bridges and last year another one was added. It’s the pedestrian footbridge that links its south bank to Bedford North, a £40m, 3.6-acre mixed retail and leisure development that once upon a time was a cattle market, then a brewery and later a car park. Bedford Council joined with mixed-use development specialist Coplan Estates and property development firm Linkcity to develop what had been viewed as ‘back land’, and so breathe life and energy in to this working town with industries that through time had spanned wool, engineering and brick making. The aim was to create a positive social and economic impact for the local community in a neglected area just south of Bedford historic commercial centre and just west of its civic hub at St Paul’s Square. The decision to build a seven-screen Vue Cinema was apparently the catalyst for investment by others in the retail sector and its position takes centre stage. 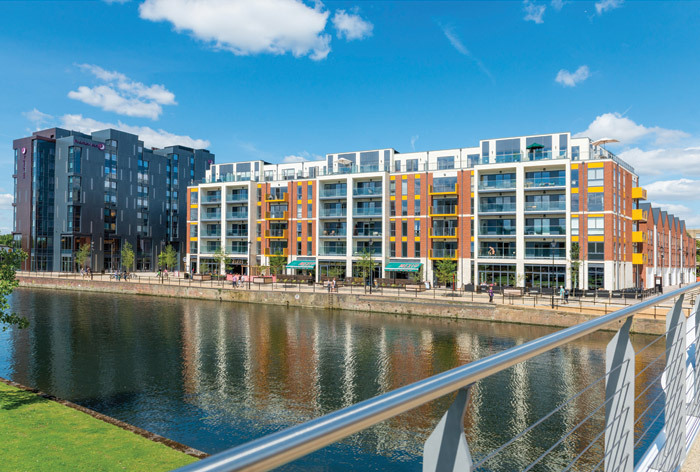 What has then emerged are restaurants such as Wagamamma, Zizi and Coal Bar, a 100- bed Premier Inn, 66 residential units, two new public squares and of course, the 4m-wide pedestrian footbridge that links South Bedford to its town centre. The scheme is beginning to reverse the leisure spend that had been leaking out of the town to competing town centres and the prediction is that the development will generate £10m of local expenditure and help create hundreds of local jobs. The existing riverside walks have been revitalised, which has helped the aesthetic appeal, and now offers a safe and vibrant place to visit. The site’s location between Bedford’s commercial centre and the river was identified as a significant factor as a connecting ‘corridor’ between two areas that had become somewhat disconnected. Visual connections were reviewed and improved visibility of the river became a fundamental design consideration. Key to this was redeveloping Riverside Square, which allows the link between river and town. The site’s Conservation Area status and in particular the historic Cowper Building was also a consideration in how development proceeded. The aim was to preserve the best of this part of Bedford’s historic architecture while also injecting commercial and residential life through a mix of retail and housing. The landscape strategy and the importance of the public realm has been integral to the whole operation. The design objectives were to create a strong sense of urban cohesion, spatial definition and a sense of identity. Emphasis has been put on creating a favourable environment for both pedestrians and cyclists while limiting/restricting vehicle access. The pedestrian network includes seating areas that allow a change of pace along the movement routes while further seating areas are positioned in the squares and along the river frontage. There has been new tree planting; large structural trees to reflect the scale of the spaces or smaller sculptural trees to create a more intimate character where seating is more discreet, sub-spaces between buildings. The mix of soft and hard landscaping allows for vertical features such as the taller, street trees and feature lighting while paving materials, street furniture and soft landscape elements complement the built form while creating a contemporary external environment. Key design objectives for the landscape strategy included the creation of character, quality and a sense of place, a pedestrian network, somewhere safe and somewhere that acknowledges both the urban setting and adjacent and beautiful river corridor.